The Gatwick Area Conservation Campaign is a voluntary association, with an executive committee elected each year at our AGM. Care is taken to ensure that our committee includes representatives from each area around the airport, and that each committee member is prepared to work for the general public welfare of the whole Gatwick area. GACC is totally law abiding, and relies on rational argument to influence government and aviation authorities. Because we represent the whole area around Gatwick, because we are democratically elected, and because we have established a high reputation for accuracy and constructive proposals, we have strong support from local MPs and considerable influence in Westminster and Whitehall. 1970 - persuaded Government to drop plans for second runway, and to go for Maplin instead. 1980 - obtained safeguards, including massive earth bunds, as a condition for construction of North Terminal. Defeated proposal for large new maintenance area. 1985 - defeated Gatwick to Heathrow helicopter service. 1985-95 - successfully pressed for new noise and track-keeping equipment, with penalties on excessive noise. 1995 - defeated Government plan for new runway north of the airport. 1999 - played a leading role in drawing up new legal agreement to protect the environment. 2002 - GACC lobbying (especially our booklet ‘We Trust in the Law) persuaded the Government to drop plan for one or two new runways. But this was overturned by judicial review. 2003 - GACC campaign Say No Way Gatwick Runway influenced Government decision to rule out new runways at Gatwick (unless Heathrow runway proved impracticable). 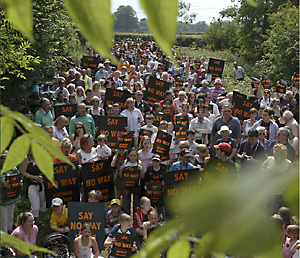 2003 onwards - played a leading role in the AirportWatch campaign against airport expansion. Helped persuade Conservative and Lib Dem Parties to rule out new runways. 2013 - Led the campaign against a second runway. Except where shown please email info@gacc.org.uk to contact us on matters other than press or membership queries. We have 15 members of our committee, elected annually at our AGM. They come from Charlwood, Coldharbour, Crawley, Forest Green, Horley, Nutley, Reigate, Smallfield, and Warnham. If you would like to join our committee and are prepared to work for the environmental improvement of the whole area around Gatwick, please get in touch.